After two years or running our Retreats in Bali and after our first Salti Hearts x Mentawai island Trip adventure; we are beyond exited to take another group of women for 2019 to one of the most beautiful places we have ever been. Salti Hearts founder, Yeni Canelon, loves travelling, surfing, yoga and new adventures! 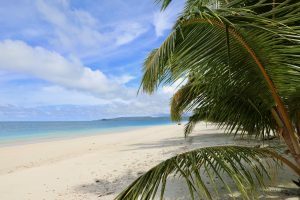 Yeni has visited the Mentawais Islands five times recently and loved every minute of it! She cannot wait to share this paradise with you!!! The Mentawai are a beautiful island chain off Sumatera and are widely considered to be the most amazing surfing destination on the planet. There is no other place on earth with so many high quality waves for all levels of surfing in such a small area. Join us on the trip of a lifetime in paradise surrounded by like-minded women, natural beauty and in the comfort of a luxury Resort. This is the perfect holiday, for those looking to escape, relax, unwind and take your surfing to the next level! You will ride the most amazing waves, practice yoga everyday by the ocean and meet other inspiring women from around the world. 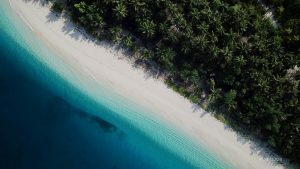 The Resort is one of the most beautiful in the Mentawais, located on the small tropical island of Simakakang, 15 minutes away from the main port of Tuapejat. White sandy beaches, magnificent coral reefs, turquoise waters, lush tropical vegetation and perfect waves for all surfing levels surround this secluded island. To ensure the best possible experience, we will have a maximum of 9 surfer ladies for the Retreat. The resort has a top of 12 surfers policy, meaning the lineup will never be crowded. Each of the bungalows is entirely self-contained, with ocean view, living room, private bathroom + open air shower, hot water, ceiling fans, mosquito nets, mini bar, large deck, beach chairs, beach towels with a daily cleaning service. 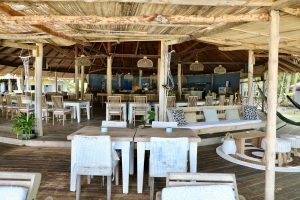 The Resort offers a tropical spa, beachfront bar & restaurant, library beach lounge, gift shop and a 2km private beach surrounded by palm trees. The Mentawai has the most amazing waves to offer for all surfing levels. The swell is consistent, between April and October. Waves can be between 2 to 6 foot depending on the swell direction and surf spot. We chose October to run our Salti Retreat as it traditionally has the lightest winds, which opens up a whole smorgasbord of fun waves! Most of the waves are accessible by boat, luckily there is a super fun right-hander right in front of the resort and Telescopes its only 10 minutes away. It doesn’t matter if you are goofy or regular this place is paradise! Tikus; a forgiving uncrowded left-hander. Its 5 to 10 minutes walk from the resort and its suitable for all surfing levels, including beginners. Telescopes; A world class left hander waves, that offers more flexibility than other waves in the area. Cruisey take off, and often the most perfect tube on big days and fun walls for carving and hot dogging on small days. Some other waves you may have heard of – G4, Hookers, Icelands, Ombak Tidur, Suicides, Twiggies, Scarecrows and Seven Palms are the most regularly surfed, as they are close by the Resort. We will practice Yoga everyday lead by Yeni at the beautiful Yoga Shala just a few steps away from the ocean. Our yoga and meditation classes have been designed to be suitable for all levels of knowledge and experience. 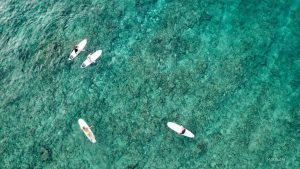 The classes will complement your surfing program with a blend of morning and afternoon sessions, each practice will allow you to truly take some time out to reconnect with your mind, body soul. We aim to ensure that after each session you will be blessed with a deep feeling of relaxation and gratitude. The class’s be either morning or afternoon depending on surf conditions. The Mentawai Islands are relatively easy to access. It just requires a few more steps than the usual destinations… totally worth it! Getting to the Resort (15 minutes by our private boat). Same on the way back. We will have our own vans to transport us to the Mercure Hotel to spend the night and the following morning at 6:00 am take the Mentawai Fast ferry to Tua-Pejat. Getting to/from the Mentawais: the Mentawai Fast ferry is the safest and most reliable transport available. We will be departing from Padang on Friday the 11th of October 2019 at 6:00 am and arrives in the Mentawais around 9:00 am. On the way back the Mentawai Fast Ferry departs from the Mentawais on Sunday the 20th of October 2019 at 3:00 pm note that on Sunday it takes 2 additional hours due to another stop on Sipora island). Will be staying at a 3-star Hotel and everyone departs the next morning Monday 21st . Getting to/from The Resort: At the harbor we will be greeted by the resort team who will guide us the rest of the way (it will takes us about 10- 15 mins to get to the resort from the harbor by boat). Usually by 10:00 am we are already checked-in and ready to go explore or surf. Aside from all the surfing, sunrise, sunsets, yoga, meditation classes, there is so much more to do at the Island. You can go beachcombing, swimming and snorkeling, in the most crystal waters. If you are a fan of seeing the underwater wildlife; the Resort offers free snorkeling equipment (and private guiding as an extra)! Stand-Up Paddle (SUP), is easy fun to learn and a great work out. You could either cruise and explore or try to catch a few small waves. Diving! The resort has the only PADI Diving Center in the Mentawai, suitable for all levels, offering different packages, so if you have your PADI certificate don’t forget to bring it along on the way or extra Cash USD$ to get your certificate. As we will be travelling to a secluded Island your packing list might be a little different than usual. – We highly recommend you bring your own board (however if this isn’t possible let us know when booking and alternative arrangements can be made)! Don’t forget to take the fins out, bring your fin key +write fragile on the board bag) and check with the airline about the sport equipment fees & allowance. – Tight and well fitted surf bikinis (tops/bottoms make sure you have spares). – Long sleeves shirt and pants for evenings. – Sunglasses, hat or Cap. – You can bring your debit and credit cards to take cash out at ATM’S Points at the airports and near the Hotel. – USB stick or hard drive compatible with Mac to take the photo memories with you. – Personal First AID kit (antiseptic and antibiotics in case of any infections). The Resort has an AID Kit, but does not have a doctor; there is one 15minutes away by boat at Tuapajet village. – Visa: Visitors from most countries now do not require a visa. A 30-day tourist visa on arrival for $25 USD still applies for some countries. Another options are to apply at the Indonesian embassy in your country for a 60-day tourist visa. – Insurance / Evacuation: Travel Insurance with evacuation coverage is Mandatory for your personal safety. In the case of an emergency, we will assist you to contact your insurance company. “The most important thing to bring to this Retreat and new adventure is lots of positive energy and an open heart. Be ready to have the best time ever in the water, on the mat, on the island and with your new Girlfriends”.